BP has succeded in the spin. MSM have jumped on the "cork the well" bandwagon and remain ignorant on the long term enviromental damage that so far been held away from the public's eye. At least US Congress has launched an investigation into BP's efforts to buy silence in the scientific community. First-hand accounts from residents and environmentalists tell a wholly different story, though. Apparently innumerable dead animals were carted away under the cover of the night and the beaches cleanup is a bluff as oil is found a foot below in many places. University of South Florida researchers are rebutting BP claims that beaches hit by oil from the Deepwater Horizon spill are clean, noting evidence of tar balls and buried oil along miles of sand in northwest Florida and Alabama. While the beaches appeared clean after crews left, closer inspection revealed tiny black tar balls, the scientists said. They also said cleanup efforts did not address layers of oil buried inches below the sand, accounting for possibly more than half of the beach contamination. "That leads us to the conclusion that the cleanup at this point is basically superficial," said Ping Wang, a USF beach geologist who led the research. "That maybe using these machines which are crushing the tar into small pieces may not be the smartest thing to do." The reason BP has gone to such great lengths to hide the devastation caused by the irresponsible drilling operations and blow out at Mississippi Canyon 252 is financial. 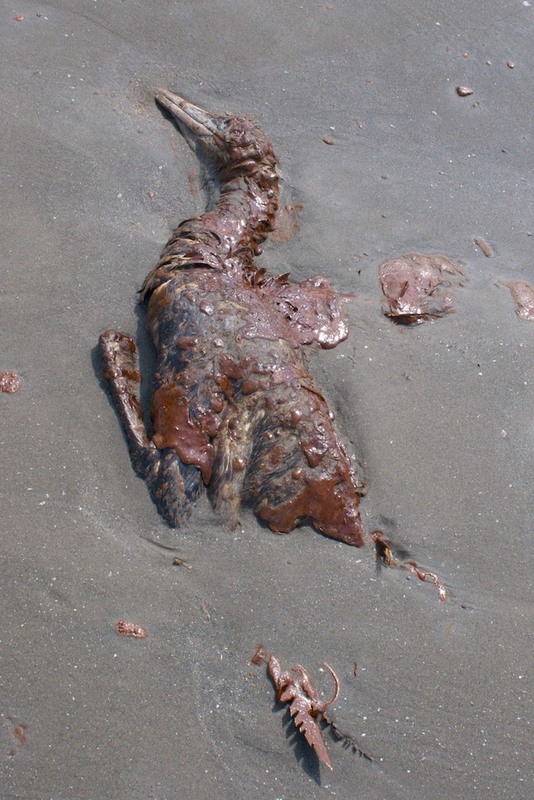 Every death that results from the oil spill has a cash value, whether animal or human. Images of dead animals are difficult to spin in the media, and they resonate across all demographics. BP also has a strong interest in maintaining a business-as-usual model for the beach resort communities along the Gulf Coast that have been economically devastated and lost the majority of their annual revenue during the summer season of 2010. The only sharks circling the Gulf waters now are based on land. I recommend to read his entire report that makes it clear BP is rather interested in a coverup than a cleanup. Read more first-hand accounts in this second post that reveal that BP is very well aware that contact with the spill will cause cancer. Jerry Cope: Well, last week, we spent two days flying over the Gulf. We went south from Louisiana and then all the way out, then back, all the way back up to Florida. And for as far as the eye can see, the entire Gulf of Mexico is a very strange green color. It’s not blue at all; it’s green. And it’s iridescent. You can—the dispersant, obviously, covers the entire ocean out there, well beyond the site of the spill. And there’s nothing moving. We saw, in two days of flying, four dolphins, that didn’t appear to be very happy, and then three schools of rays, as I put in the article. There’s nothing moving out in the water there. And as far as the effects of the Corexit, the EPA came out with these wonderful reports yesterday how it’s no more toxic than the oil. But I didn’t read in any of those reports just how toxic the oil was. BP, in their training classes for hazmat, all of the crews that worked on the spill, part of that training, which was a four-hour program, is they told them, in no uncertain terms, if you had any cuts to your skin, abrasion, open wounds, and it was exposed to the crude oil in the water, on the beaches, any form whatsoever, you could pretty much guarantee yourself that you would get cancer in your lifetime. That was part of the training class. So, the oil is most definitely toxic. The Corexit is very toxic. In my opinion, it’s terrible. It evaporates and puts all of this up into the atmosphere. There’s a lot of sick people along the coast. And I called it the Jaws syndrome. It’s life imitating art on a scale that’s hard to wrap your head around, because they are pretending the situation is entirely normal. I still consider this biggest man-made environmental disaster of the utmost priority. For more interesting commentary on the forces in the oilspill disaster surf to Swiss based Dailybell.com.